As we hurtle towards the Brexit deadline of March 2019, albeit with the prospect of a transition period of at least 18 months, it’s worth pondering just where our movement stands and where do we go from here. We are rightly committed to the “Gold Standard” of referenda, which basically means we need to repeat the conditions which applied in 2014. This poses a major problem. The 2014 referendum was faced with the prospect of its legality being called into question and challenged in court. This was overcome by what was known as the Section 30 Agreement between the Scottish and London Governments. It meant that London gave its consent to the referendum going ahead and put it on a sound legal basis. Now, we can reasonably assume that David Cameron only went along because he was convinced that the most likely outcome was a resounding win for the unionist camp which could even have been of a scale which would have killed the issue. Given that the YES vote was barely reaching 30% that looked a not unreasonable position. Cameron of course suffered from the fact that his main source of information was from the NO supporting parties and from commentators suffering from metropolitan blindness. Given that Theresa May has a wee bit more information i.e. the YES vote is still at a base 45%, her agreement is highly unlikely! (OK her survival as PM is also highly unlikely.) It was assumed that the YES vote would merely give up and go away after defeat but we now know that to be far from the case. The YES campaign is not only still there but is beginning to gather itself into a fighting force again. And this time from that far higher base. Indeed, what might be the most surprising factor is that the unionist position has not found succour in the “well we voted and that’s it over” position which does seem to be a major reason why the demand for a second Brexit ref has struggled to gain momentum. Fortunately, Scotland doe not seem to have the same level of fatalism as our Southern cousins. But, the fact remains that one of the key reasons why Cameron gave way was that the SNP had won a majority on a specific manifesto commitment to holding a referendum. This was absolutely crucial! In 2016 we were unable to repeat that feat. There are a myriad of reasons and a multitude of theories why but none of them change the fact. Yes, we are the largest party, yes, we have a majority if the Greens remain consistent and yes, we had a commitment to hold a second referendum if Scotland was being dragged out of the EU against its will. All good, but not the same as the copper-bottomed mandate from the people in 2012. So, how do we persuade Theresa May, her Tory backwoodsmen and the Neanderthals of the DUP to gamble again. Damn good question. While Parliament passed a motion in 2016 to hold a second referendum, the Tories will certainly point to the 2017 General Election and say that with 21 seats lost and gains by every unionist party, the will of the people was not to hold a second referendum. If we are to hold a second “Gold Standard” referendum, we need the agreement of the Westminster Government. There is just no alternative unless we want to fight it through the courts and that’s a massive gamble. Westminster is utterly consumed by Brexit and the enormous amount of legislation which it will entail. This will certainly mean that we have little, if any, chance of gaining consent. Additionally, the clock is seriously against us. Although the date of Brexit is set for 29 March next year the simple fact is that deal must be agreed by probably October/ November at the latest to allow time for all 27 countries to meet their own Parliamentary timetable, perhaps even with some holding their own referendum. The deal then has to go to the European Parliament for it’s ratification. Yes, it does seem that everybody gets a say apart from the people who voted to “take back control”. I readily acknowledge that Nicola has played her hand pretty well so far, and that she is extremely tactically aware. I don’t dispute that the troops are getting restive for the battle. I still struggle to see how we meet the self-imposed “Gold Standard” test before either March 29 2019 or the end of 2020. Do we acknowledge that we need to repeat the specific manifesto commitment and success of 2012? Do we abandon the “Gold Standard? Do we say “ignore the 2017 General Election results” we have Parliamentary Consent from 2016? There is a fine balancing act here for the Leadership. I had looked forward to being enlightened at the Conference. Just a pity that the Agenda Committee did not! Previous Post: Civil War – where? History tells us that we are a Nation that has been extremely badly treated by our Southern Neighbours. Our assets have been pillaged for centuries and this has continued to be the case today. Our gems such as branded goods are now degraded with Union Jacks and are often, as a result, left unsold on supermarket shelves. Westminster based politics will continue to belittle our nation at every opportunity and with a biased corrupt media aiding them, you’d have thought SNP, the Greens, Scottish Socialists would have significantly weakened. Not on your life. The passion is still there and SNP is now the second largest party by membership in UK. This is phenomenal for a Nation with less than ten per cent of the UK population. The rise in SNP membership is a significant factor along with a claimed decline of around 40,000 UK Labour members who have given up on their party’s leadership. SNP Membership and activists are critical to support the wide Yes movement that must keep the faith, tough as it is some days. The way Scotland is treated by Westminster is never going to improve, no matter who is in power. We will always be beholding to Westminster, they have proven they can’t be trusted on our devolved powers. 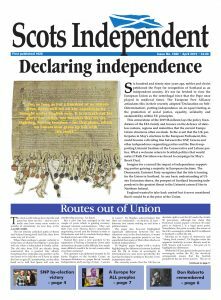 The UK Media will never support Independence. Scots of all origins have to face up to the fact that Independence is our only hope to avoid becoming a depressed region of England. Remaining in the EU is at worst, a stable environment to protect jobs and trade compared to the disastrous future the UK is trying to force upon us. We have the skilled expertise and assets, we just need the Yessers Scottish pride and passion over the coming weeks, to help our leaders make the right strategic decisions.